Happy February y’all! Did January feel as long for you as it did for me? It’s hard to believe that just a month ago I was in the hospital discussing with doctors about the potential for an early C-section delivery. And since then we’ve moved to a new city and I’m looking at a C-section on my actual due date. I feel so very grateful on how things have turned out thus far. The C-section is scheduled for about a month from now and sh*t’s getting real! I have a ton of appointments and education classes lined up with Kaiser, so I’m lucky to live only 5 minutes away (for the week of Feb 11 alone I have appointments scheduled on 4 out of the 5 weekdays, including a tour of labor and delivery on Valentine’s day-lol how romantic). Also recently I got my style groove back, despite feeling like an absolute whale, thanks to Rent the Runway (more about that at the bottom of this past week’s post here). I’ve come to realize, it doesn’t really matter what your shape is, there’s ways to be stylish no matter what and it’s just about having the mindset to try and care. And no it doesn’t pay to care all the time but making an effort once in awhile is a good mood booster, especially when you feel like you’re in a rut. On the FIRE (Financial Independence, Retire Early) front, we’ve really worked to cut down on our spending despite the move and buying a couple new pieces for the new apartment. But we didn’t get much, just a shoe bench and some shelves from Wayfair. We also installed some light fixtures we got from Lowe’s and it’s made a huge difference in the space. We realized too that it’s worth spending some money on things that you use daily (like light fixtures) and save in areas that are temporary/intangible (eating out, movies, etc.). Now we’re looking into investing our savings into ETFs/mutual funds that will give us that 7% annual return (the cornerstone of FIRE). Also we recently watched this video to keep the FIRE inspo going. I like the message and all, but then when it comes to what are some actionable steps (which I asked in the comments but didn’t get a response), I’m kind of at a loss. I guess it takes political activism but I’m not too sure where to start and voting alone is not enough. I did look up how to reduce income inequality and really it’s all about policies, changing laws and tax systems—all of which the US is currently not doing. 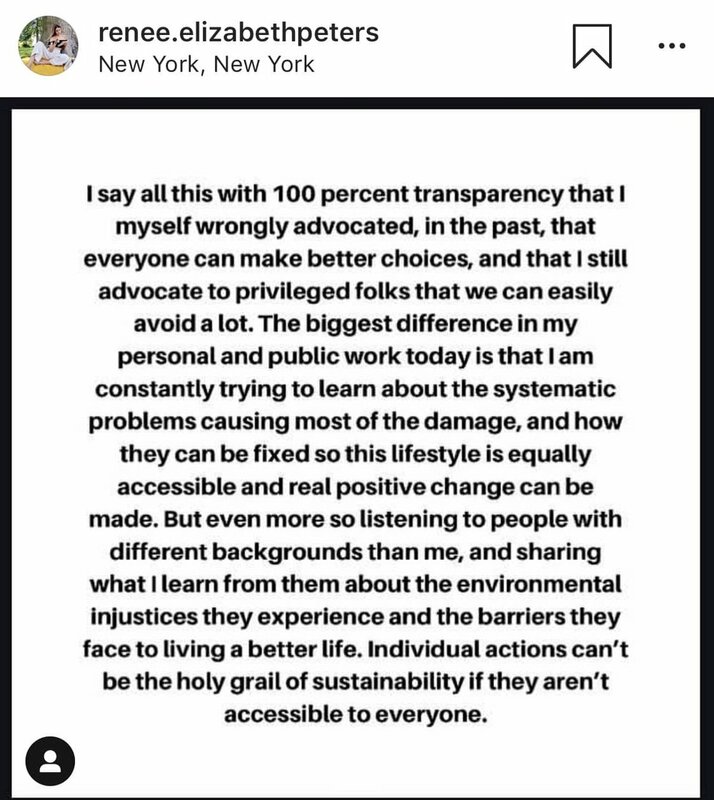 Some things I read this week: This post by Jess for Less is a great primer in thrifting and this article about the Kardashians makes me sad/angry (imagine if they put their power behind sustainable or ethical fashion instead of items that fuel fast fashion). For a full review of them, go here. But a quick summary: these are great over the belly leggings if you’re tall (at least 5’6” and above). Otherwise the legs are way too long and the torso portion comes up to right under my bra (and there’s a seam that goes up that irritated my belly every time I wore them). However if you are tall and are looking for a pair of super soft, stretchy, fully opaque and ethically-made over the belly leggings these are probably your best bet. These are under the belly leggings that are thick enough to wear alone as pants if you choose to do so. They run a tad small and the size 2 (medium) was a bit tight for me though I’m normally a medium. I also found that the waistband folds and bends, which is a pet peeve of mine. At $128 these are the most expensive of the bunch, and I think the worst value. They weren’t the softest and I found they had a bit of a scratchiness to them. They are however made in New York and so if we assume they are following all US laws (and why not), then they are ethically made and workers are paid a fair wage. This is also presumably why they are the most expensive. These are not maternity specific leggings but since I knew I was looking for some under the belly leggings, I thought these might work. So I purchased them in a large (I’m regularly a medium) and I think they work fine. 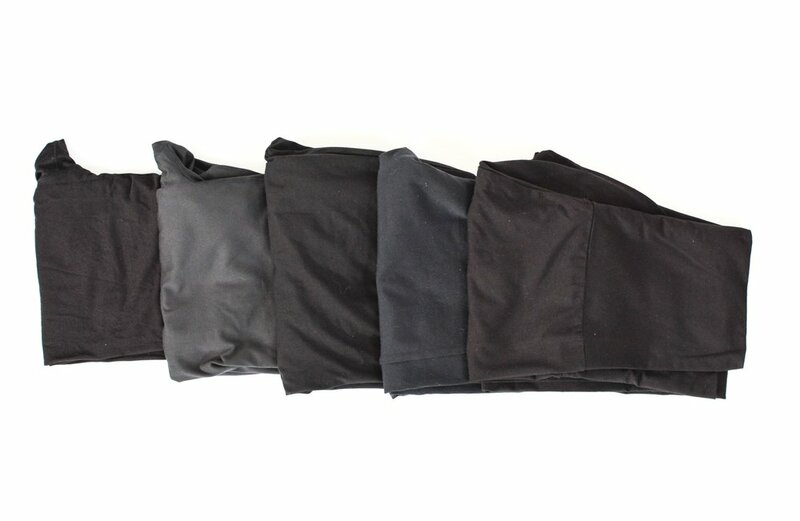 Since they are on the thicker side, you can wear them as stand alone pants and they are fully opaque. I did find the large were a bit too big in the leg area for me and they bagged a bit, but they weren’t too long (I’m 5’4”) so they’re probably too short for those who are a bit taller and want to keep their ankles covered. As for me, I found them to be the perfect length and they hit right at the ankles. The seams are a bit more noticeable than the Storq leggings and the PACT leggings aren’t as soft as the Storq ones, but for half the price I found them to be of pretty good value. So far these have held up great though I’ve heard mixed reviews about these leggings and some people have found that they don’t last very long (I personally don’t wear leggings all that often, maybe about once a week max and these aren’t my favorite so I’m probably not wearing them more than once a month right now). I decided to try these undoubtedly unethical line of leggings because after doing some research on the internet, a couple of mommy forums were raving about how great these leggings were. And as much as I wanted to stick to ethical clothing during my pregnancy, I wanted to keep an open mind about what’s out there (who knows, maybe the cheapest option really is the most comfortable). Well even though these leggings promised to be seamless they weren’t. I definitely felt the large seams running up and down my leg and that made it uncomfortable. Also I tried both the over the belly and under the belly versions of these and both were too long in the legs for me. The material for these were the most athletic and had a sheen to them, which is not what I was looking for in my leggings. In the end I returned them and at least I know I wasn’t missing out. So these were my go-to pair of leggings I was wearing under dresses and skirts pre-pregnancy and are several years old. I don’t know why I just didn’t try these out first since I already had them, but for some reason I had it in my head that maternity leggings had to be over the belly. Only after trying out the various leggings up top did I realize that I, one, dislike over the belly leggings and that, two, these heat tech leggings worked just as well during pregnancy (I just have to roll over the waistband a couple times to make them fit under the belly). And this was the most ethical and cost-effective solution since I’ve already had these for several years. Too bad I only discovered this after already going through all the ones above facepalm. Ah well so lesson learned: try what you have first (the first lesson in ethical closets, right?). So that’s what I recommend: if you already have a favorite pair of leggings, see if they work for you by rolling the waistband to make them under the belly leggings (especially if you’re only briefly pregnant in the winter/spring months). If not, then depending on your height and what you may need I recommend either the Storq ones or the PACT ones. P.S. I’ve just recently tried these faux leather leggings from Ingrid and Isabel (through Rent the Runway Unlimited and these are not the Target line but their own branded leggings) and I have to say I love these under the belly leggings. They’re very thick and warm and if you’re wearing a maternity tunic, it’s sort of like wearing pants. The medium size is very true to size and fit me perfectly. If you’re looking for something that’s a bit more than your regular ‘ole leggings I highly recommend these! J&M Davidson Gabby bag: Love this simple, clean looking bag in beige. I had never heard of this British brand before but stumbled upon them on Instagram. I love their quality-looking bags and the fact that their bags are lined in napa leather (something only high end designers usually do). But by waiting til the end of the month to purchase (and not sure I would have purchased anyway since they are not transparent about their production methods and ethics) it’s now sold out. So I’m glad I don’t have to think about that one anymore. Tome Striped Shirt from The RealReal: I heard of TOME through a blog post about high-end sustainable brands and it really piqued my interest in their environmentally and socially conscious business. Plus I’m a sucker for stripes and so this quite affordable shirt from The RealReal has been on my wishlist this whole month. But I’m a little hesitant to pull the trigger since I really don’t want to be buying clothes for my current prego figure, only to not have it work out later this year. So I’m going to hold off. Article & Goods No B2 bag: I also stumbled upon this leather camera bag whilst on Instagram (this is why Insta is so bad if you’re trying not to consume so it’s a good thing I have my resolution in place). This is a unisex brand, based locally in San Francisco, while all their leather goods are handcrafted consciously in China. I definitely fell in love with the brand’s mission and the founder’s story (his mother was a garment factory worker). Because of their small production practices, all their items have been sold out all month so that saves me as well. Mansur Gavriel Ocean bag: So I no longer own any MG bags, but that doesn’t mean their newer styles like this Ocean bag (and most recently the mini travel bag below) doesn’t turn my head once in awhile. I probably won’t seriously buy anymore MG bags but I can still admire them from afar. Mejuri Single Mini Hoop: So I’ve started wearing huggies on my ears since it’s the most comfortable earring to wear when side sleeping (thanks to pregnancy). I’ve been wearing these gold and diamond huggies I got in December from Saks Off Fifth but I have a second hole on my left ear lobe that could use this Mejuri single hoop. I think the plain gold along with the diamond and gold huggie would be a cute combo. Also this single hoop is so affordable for 14k gold (granted it’s tiny). Plus this fairly transparent brand has been on my radar for so long (due to ethical influencers) and I really want to give them a try. I know! This exercise in waiting and collecting a list of things to buy has really helped from impulsively purchasing anything. It’s kind of amazing. And yes I still want some of these things (like the earring and the Article & Goods bag), but I can wait. So instead of buying any of these things I decided to spend $120 for a Rent The Runway Unlimited subscription for a month (right now they’re going for even cheaper, for $99 darn it!). I decided to try out this service because in my ultra prego state (8 months + fibroids that make me look like I’m carrying twins) I’ve only been wearing 2 things: my maternity denim overalls from Gap and my Elizabeth Suzann Georgia Midi dress (what a lifesaver!). And in general I felt like I’ve been in a style rut, but I’m not about to splurge on new clothes. So what better than to rent, and RTR offers rental of maternity clothes! Anyway once I’ve tried out the service, of course I’ll be doing a review and will let you know if it’s worth it. So how’s your new year’s resolutions going? For those doing the #byebuychallenge on Insta, were you able to go without buying? P.S. Also I was tempted by Everlane’s texture cardigan this past week, which I wrote about in my weekend update. I’m actually really glad I set this resolution into place because I feel like the cardigan would have been something I really wanted in theory but would not have worn as much in practice. Duh, I have to start with what I know best. I haven’t personally tried this particular Relaxed Jean Shirt ($60) but I’ve tried a ton of other Everlane’s button-down tops and can vouch for their generally good quality (especially when it comes to their cotton and linen versions, not so much their old silk versions). This is a chambray shirt at its simplest and most classic form. Another tried and true ethical company that gets a lot of attention in the ethical blogosphere is Tradlands and their version of the chambray shirt is called The Clare ($167). I’ve tried their items in the past and really loved the quality of their cotton button-down shirt (reviewed here). Yes the tops are pricey, but the quality is unbeatable and so is their attention to detail. Also here’s a great review of some of Tradlands tops from Andrea, one of my favorite bloggers. P.S. If you’re an XXS you can score a great used one on Slowre right now! I haven’t personally tried this ethical Canadian brand but I’ve heard a lot of good things about them from numerous bloggers, and have been tempted get something from them myself. Their version of the chambray shirt, called The Wordsmith ($85.84), is a beautiful steel blue color though not a traditional chambray look. They also have a chambray-looking shirt called The Pillar ($139.30) that’s actually 100% linen and probably a great summer option. Though I can’t personally vouch for this brand, all these trustworthy and excellent bloggers can: Lee from Style Bee, Grechen from Grechen’s Closet, and again Andrea from Seasons+Salt. I really love this ethical, small-production Oregonian brand and I’ve been a past Bridge and Burn customer so I can vouch for the quality of their items. I personally purchased a dress in this material (reviewed here) and love it for the summer. It was super lightweight, soft, yet felt durable. It’s not your traditional chambray material but this Japan-made fabric is not only of premium quality but also a fun take on the usual chambray. If you’re looking for a short-sleeved version then look no further than ABLE’s (note: this referral link is for $20 off) classic chambray shirt called the Pilar Popover ($98) made in Mexico. I haven’t yet tried this brand though they’ve been on my radar for quite some time now and I’ve been itching to get something from them (I probably will this year, but since I’m on my one-new-item-only-per-month resolution, it’s probably going to be later in the year). I love that this company focuses on creating jobs for women in developing countries and their products are pretty classic as well. Some bloggers that have reviewed them include Caroline from Un-Fancy, Lee from Style Bee and Andrea from Seasons+Salt. If you’re looking for another untraditional take on the chambray shirt then kowtow has a really sleek looking black version for sale on their site right now ($109). Kowtow is an ethical brand I heard of through Grechen of Grechen’s closet and they’re a bit more obscure though upscale. You can also find their stuff on ASOS or on the Garmentory. They like to use high-quality organic materials and are very transparent about their production practices in other countries (mostly India). I can’t wait to add a kowtow piece to my wardrobe this year (like this dress or this dress) but probably post pregnancy! It’s been 1 week since the move and we’re still living in boxes but otherwise I feel good. I love our new apartment and how cozy it feels. Also our new location is fairly convenient and I can walk to a lot of places if I wanted to. I look forward to exploring my neighborhood more this year! Also another aspect of apartment living that I’ve noticed recently is the whole elevator vibe thing, which is new to me since I haven’t lived in an apartment complex in a long time nor in one this big. As an introvert I would rather not see anyone in the elevator, but even a brief pleasant exchange, a smile or hello with your apartment mates in the elevator can really lift the spirit. While being in an elevator with unfriendly or unhappy people can also send out a negative or heavy vibe (which I most likely encounter during the hours of 6-7pm from tired people coming back from work). What interesting social creatures we humans are, lol. Anyway as you can see this is going to be more of a rambling post than anything. So please excuse me while I ramble on about Everlane’s texture cotton cardigan (aka the babaa knock-off). When I first saw this in their Coming Soon preview I was like “uh-oh, this is going to conflict with my new year’s resolution of only 1 new closet item at the end of the month.” Because of course who wouldn’t want the cheaper version of the cardigan that every ethical closet blogger has? But after reading Karen’s review, I’m not so sure I would have loved it. First of all it is 27% nylon (so over a quarter of it is made of plastic—I guess Everlane’s promise of no new virgin plastic in their products really is going into effect 2021 and they’re in no rush to make changes just yet), which I know is to keep the costs down and would help retain the sweater’s shape when using cheap cotton. But it is an inferior product to the 100% premium cotton babaa knits made with consciously harvested spanish cotton. Also at the end of its life, the babaa one is fully biodegradable since even the buttons are made of recycled cotton fiber, while you know that the over-quarter-plastic Everlane one will not fully biodegrade). Anyway I’ve been lucky enough to try the babaa cardigan before (thank you West Coast Craft) and I can attest to the quality of these really heavy cotton knits. I can see how an item like this gives Everlane a “fast-fashion” reputation because right now they seem pretty Zara-like when it comes to this cardigan. And yes even though the styling looks the same, the cardigans themselves don’t look the same (the Everlane one looks flimsier and thinner). It seems to me that the whole point of buying ethically is to buy less but better (consume slowly and consciously), but this cardigan is just a substitute for those who want the look of the trend. If you really were going to consume ethically, then wouldn’t saving up all your pennies to buy the one coveted cardigan you’ve always wanted and that you’ll treasure forever be the way to go? You know the babaa sweater is not going to be in the donation pile anytime soon. But I get it, not everyone can spend several hundred dollars on one item of clothing (especially if its a trend or if they don’t know it will suit them). Also I can see the merit of the Everlane sweater being thinner so less bulky than the babaa one (I personally passed on the babaa at the time because I thought it was too bulky). Well it seems a bit of a gray area to me but I do expect to see this cardigan pop up more on Insta and other blogs and for it to be sold out in a month. Also if it weren’t for my resolution I know I would have tried this out to review so who am I to judge? P.S. I found this post about the ethics behind purchasing fast fashion secondhand and liked some of the issues it raises. What do you think: is it ok to buy secondhand fast fashion?